In an effort to bring unprecedented transparency and accountability to the Government procurement system, the National Procurement Commission is pushing to have the newly gazetted guidelines before Parliament by August. The Commission, which was formed after the 19th Amendment to the Constitution was passed in Parliament in 2015, has already sent the gazette published on 9 May and other documents to the President’s Secretariat and is awaiting them to be forwarded to the Prime Minister’s office, a top official said. Once they reach the Prime Minister’s office they must be presented to Parliament by Prime Minister Ranil Wickremesinghe in his capacity as National Policies and Economic Affairs Minister. The entire process would need to be completed before 9 August for the procurement guidelines to become law, commission members said. Commission members have already met the Speaker and President Secretary to underline the importance of completing this process before the deadline. The new guidelines have been upgraded from the previous regulations introduced 12 years ago and include several progressive measures including a framework agreement, new information systems and provisions for the Government to implement an electronic procurement system. The new guidelines also infuse value engineering processes as practised in developed countries that enable the Government to reduce cost overruns in crucial infrastructure projects. Commission members estimate that value engineering could save the Government a minimum of 10% on all construction-related contracts. The guidelines also include technical auditing of tenders. “The new guidelines also give powers to the National Procurement Commission to vet officials appointed to tender boards. If suppliers highlight conflict of interest on an appointment the Commission would also have the opportunity to raise this with other Government parties such as the Attorney General. 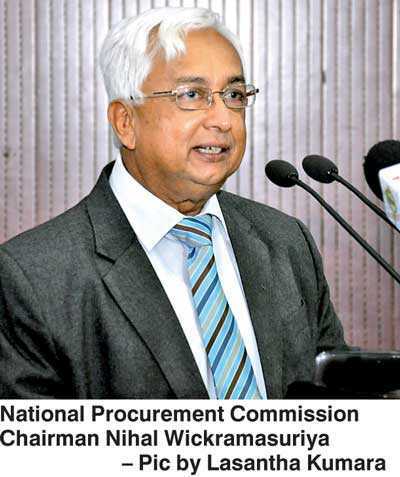 Tender documents will also be shared so that other ministries and State departments can observe the tender process,” National Procurement Commission Chairman Nihal Wickramasuriya told reporters. To ensure high levels of transparency once the new procurement guidelines become law, bidders will be given a comprehensive debrief three days after a tender is closed. Aggrieved parties can present themselves before the procurement appeal board six days after a decision is made and if they are unsatisfied with the response can appeal to the Supreme Court. After the tender is awarded any member of the public can obtain the full tender evaluation committee report. “In the case of serious allegations, the Commission can alert the Auditor General to conduct an investigation. Currently, the tender appeal board is only provided for Cabinet members but under these guidelines tender appeal boards will be established for all tenders at the Cabinet, ministerial, department, project and regional level,” Wickramasuriya added. While the guidelines include provisions for an e-procurement system, the Commission conceded that it could take as much as 10 years for the entire system to become automated but expressed hope that some steps, such as publishing tender documents online, could be taken immediately. The Finance Ministry will be responsible for implementing an e-procurement platform. The guidelines include an open contracting data standard that will enable procurement data to be rearranged in different ways for a variety of analysis. Once the system is introduced it allows public and interested personnel or institutions to use the procurement data, reducing corruption. The guidelines also introduce green procurement to decide lifecycle costing and different weightages to certain procurement so that sustainable goals can be achieved.